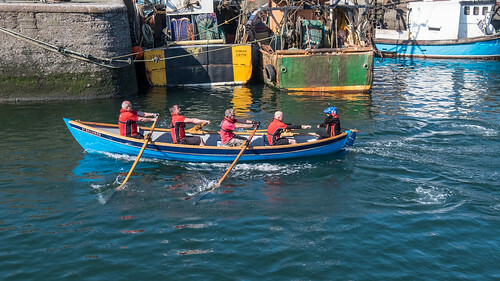 The regatta season kicked off with a glorious day of rowing and fun in, and between, the harbours of Port Seton and Cockenzie. The majority of races were short sprints, with two 180 degree turns raced in pursuit style. The close proximity of spectators makes this one of the most enjoyable regattas for all who visit and some close racing was enjoyed by all. We competed against visiting clubs from Anstruther, Broughty Ferry, Eskmuthe, and Portobello as well as hosts Cockenzie & Port Seton in most events and picked up our share of the spoils. 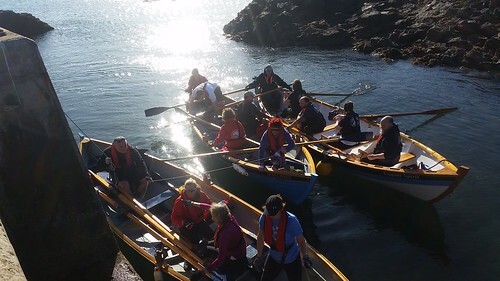 We won two events; Ladies 45+ had a convincing win in their category and our relay team of rowers and runners took first place in the long distance event. Considering all of our rowers were also competing in the over 45 events this was a fantastic win against more youthful opposition. Our Mixed Intermediate crew were a close 2nd to Anstruther and the Men’s 45+ lost out to our hosts by a fraction of a second in the final race of the day. Our hosts provided an excellent spread of home baking and good cheer and the weather could not have been better for early April. 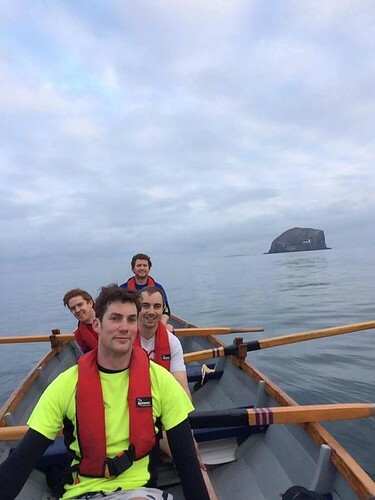 Not to be outdone by neighbours from Portobello and Eskmuthe who set off to row home, our crew of Louise, Claire, Tracy, Jacque and Dave, rowed the 13 miles back to North Berwick and made it before dark! We all look forward to the next event at Anstruther on 6th May. We set off at a good pace but still had a bit of room for chat then reached Fidra and tied the boats up at the wee harbour then. Beware on future landings it's like walking on ice, so slippy. We all climbed up to the top armed with copious amounts of cake, and coffee, watching puffins from a safe distance. The tide was a bit lower than expected and required some clambering over rocks to enter the boats again. 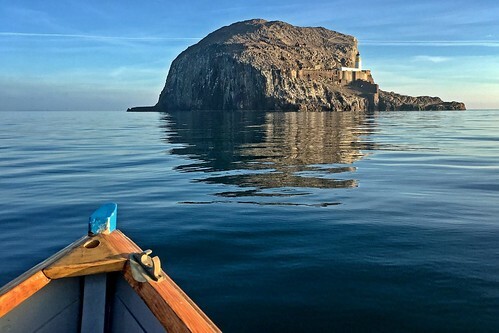 One NB boat set off to allow the next crew to get out whilst St Balded and Coquet Spirit headed off to go back round Craigleith. What a great mornings rowing, bonding with Amble and getting back with other team mates after a long winter. 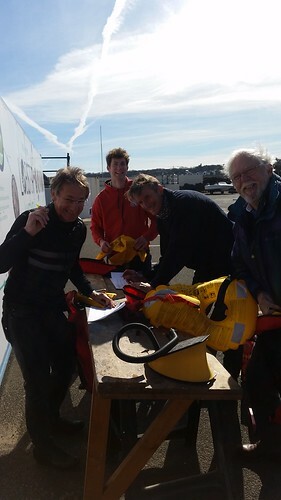 Now what other expeditions can we get up-to......anyone can organise home or away so let's get planning, it's not all about regattas, training and having fun too it's what we do best. Junior rowing starts Monday 27th March 5:45pm-7:00pm. Junior rowing this year will be Monday evenings. For the first time we will be having a series of regattas only open to juniors, so there will be opportunities to pit ourselves against other clubs. Open to all North Berwick young people aged 14-18, no experience necessary and no special equipment required. Just because it's January doesn't mean we can't get out, regular outings available to all NBRC members are available every Saturday 9:00am if you want a training workout, or 10:00am if you want a more leisurely recreational row. Just stick your name down here before the preceding Thursday.